RSMSSB IA Recruitment 2018-19 of application forms or registration links and DOIT login links are available at the main website of Rajasthan Subordinate and Ministerial Service Selection Board at www.rsmssb.rajasthan.gov.in., where you can apply online from 08th Mar 2018 to 06th April 2018 27th April 2018 through the provided links in the below section of the page. Check out the 1302 Vacancies of RSMSSB Informatics Assistant employment notification in the below section. Rajasthan Subordinate and Ministerial Service Selection Board – Welcome to job seekers to the job hub www.recruitmentindia.in, where you can search India level any type of recruitment cells in 2018. Well, today’s notification is on Rajasthan Govt Family member name called RSMSSB organization. In a couple of days back, the RSMSSB IA Notification 2018-19 was figured out from the organization on the internet. After the hearing this notification, the job seekers in Rajasthan location has shown a huge interest in this notification. Dates of the register are issued out now. Check this article in more detailed by scrolling the page as well as you get the Rajasthan Govt jobs of 2018 at here. The dates of सूचना सहायक 1302 RSMSSB Recruitment 2018 Notification is prolonged to 27th April 2018, those who are wanted to register they have up to 27th April, don’t misuse this chances. Here, in the below the candidates would see the Non-tribal area vacancies and tribal area vacancies of 1302 posts of Informatics Assistant can check now. Candidate should have Degree / Diploma in Computer Science / IT / Computer Application / Electronics & Communication or PGDCA or ‘O’ Level Certificate which are specified by the state or central govt boards. 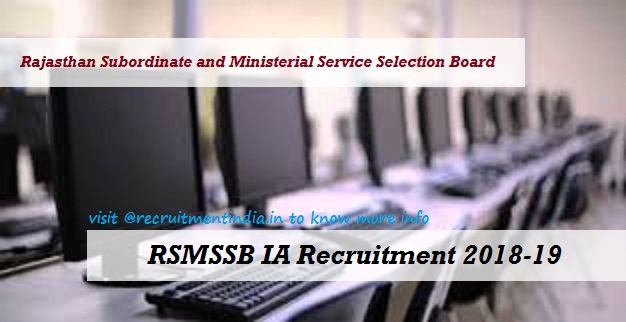 In order, 1302 Rajasthan Subordinate and Ministerial Service Selection Board Vacancies are going to configuring with the new talented candidates and skillful employees through the RSMSSB IA Recruitment Selection process. The Recruitment Panel of RSMSSB is going to recruiting the deserved candidates via RSMSSB written test and interview with these patterns, the suitable candidates will be shortlisted at finally. If you would okay with this rounds, then you would start registering from 08th Mar 2018 onwards, Check out related Exam Syllabus and Exam previous papers at here. 1302 Informatics Assistant posts of RSMSSB recruitment 2018 cell is ready for direct recruitment from 08th Mar 2018 onwards, On this date, the enrollments of RSMSSB will start and up to 27th April 2018, the RSMSSB login links will be opened to allow the new application or registration forms. After 06th April 2018, the links will be terminated. In order, the eligible candidates and willing job seekers should check out the given eligibility requirements well before going to registering your names. Well, we wish you all the best of luck. You can ask us via comment box for more info. For engaging with our page, team www.recruitmentindia.in.